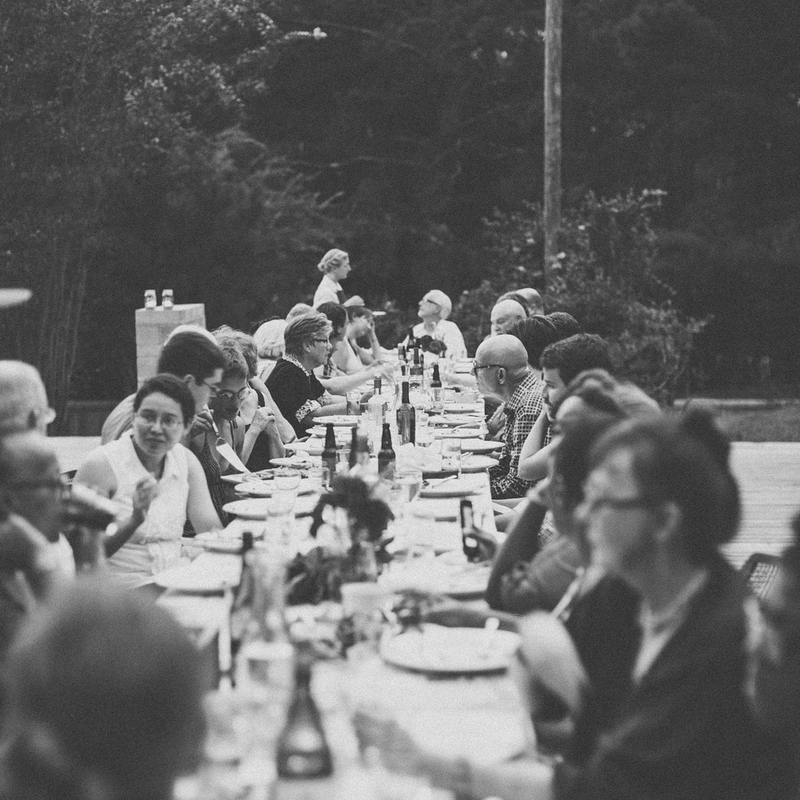 Serenbe is pleased to announce its inaugural season of Art Over Dinner. Join us at the table as we engage with the latest personalities in art and culture. At this dinner we welcome sculptor and installation artist Jamie Burmeister and the Museum of Design Atlanta. We will engage in discussion on the current and future uses of 3D printing and how artists are incorporating this technology into their practice. This evening corresponds with MODA’s current show, 3D Printing the Future. This evening presented in partnership with AIR Serenbe and MODA. Tickets: $75 per person and include dinner and drinks. Seating limited to 40 guests. Art Over Dinner is a series of intimate gatherings with artists and personalities and the organizations that support their work. On twelve evenings throughout the year, we will set one long table, set it for dinner, collaborate with chefs and farmers to bring a seasonal meal that showcases winemakers and brewers, and invite our guest artists to spark the conversation. Seating is limited to 40 guests on the outdoor deck of The Art Farm at Serenbe. Speaking of Making is a series of conversations about work and the creative process. Join us as we welcome Artist in Residence Jamie Burmeister to Serenbe. Jamie will give a presentation on how he makes his work, followed by a cocktail reception. Guests of Speaking of Making are encouraged to continue the evening with dinner at The Farmhouse Restaurant and a play, concert or film at Serenbe. At this dinner we welcome musician, composer and visual artist Paul Rucker. Paul is Serenbe’s current Artist in Residence. This evening presented in partnership with AIR Serenbe. Join us as we welcome Artist in Residence Paul Rucker to Serenbe. Paul will give a presentation on how he makes his work, followed by a cocktail reception. Ticketing/RSVP: This is a free event, open to the public. No RSVP is necessary. For one afternoon this autumn, seven Serenbe residents open their homes and gardens to the public. Come see the exquisitely designed houses and townhomes and learn more about the people and the collections that bring them to life. Additionally, we will feature Atlanta and area galleries with temporary exhibits and works for sale in public spaces throughout the neighborhood. Serenbe is a haven for the arts—a community committed to supporting artists and fostering the creative process. Join us for an inside look at how we live, what we keep, and who we value. Proceeds from this event go to support AIR Serenbe, the artist in residence program at Serenbe. As a venue for this year’s Atlanta Celebrates Photography festival, AIR Serenbe is pleased to announce the group exhibit Everything Must Go. Everything Must Go presents images made by artists who have attended the Artist in Residence Program at Serenbe, as well as artists who continue to support the mission and work of the program. Photographs by Jessica Ashley, Pinky Bass, Rob Brinson, BreeAnne Clowdus, Aaron Coury, Gail Foster, Frank Hunter, Jessie Mann, Greg Newington, Carla Royal, Gayle Stevens, Thomas Swanston, and Ali Wittorf will be on featured and for sale. At this dinner we welcome photographer Andrew Moore and gallery owner Anna Walker Skillman. Andrew will be discussing his range of work, photographing Cuba, Detroit and the American South. Anna is the owner of Jackson Fine Art, the Atlanta photography gallery who represents Andrew. This evening presented in partnership with AIR Serenbe and Jackson Fine Art. Andrew Moore is an Artist in Residence at Serenbe. Tickets: $75 per person and include dinner and drinks. Seating limited to 40 guests. Copies of Andrew's newest book, Dirt Meridian, will available for sale. On twelve evenings throughout the year, we will set one long table, set it for dinner, collaborate with chefs and farmers to bring a seasonal meal that showcases winemakers and brewers, and invite our guest artists to spark the conversation. Seating is limited to 40 guests on the outdoor deck of The Art Farm at Serenbe. Speaking of Making is a series of conversations about work and the creative process. Join us as we welcome Artist in Residence Andrew Moore to Serenbe. Andrew will give a presentation on how he makes his work, followed by a cocktail reception and a signing of his latest book Dirt Meridian. This is a free event, open to the public. RSVP HERE. After a summer of archery and a residency at Serenbe’s Art Farm, Kirstin Mitchell is opening the shipping container studio full of performative objects. Please join us for an open studio afternoon, plus cocktails and conversation. Also, meet Beth Malone and Courtney Hammond from Dashboard! This project residency is a partnership with Dashboard, AIR Serenbe and The Art Farm at Serenbe. Kirstin Mitchell is a performance artist, painter and multi-media artist with shows in Atlanta, New York and Italy. She was recently chosen as a Dashboard Artist 2015. Currently, Mitchell is working on Big Deep, a project that includes performalist self-portraits, sculptures and paintings. In 2013 Mitchell performed in the streets of Soho for a Franklin Furnace project, In Pursuit: A HUNT NY with Laura Cooper. She also participated in the Brooklyn International Performance Art Festival and with Rob Andrews at Gowanus Ballroom (Brooklyn). Kiki Blood, her most notorious guise, has served as a heroine for her performances over the past several years. In 2011,Contestant #12, in association with Love Like a Devil's Handshake, hosted at the Atlanta Contemporary, received a Fulton County Arts Grant. She has performed at the Omissis Festival (Italy) and Premio della Performance (Italy). The latter was the centerfold in “Flash Art” magazine. Dashboard connects artists with space to redefine experience. Dashboard is an experimental curatorial agency that commissions artwork and produces exhibitions in dynamic spaces. Dashboard encourages risk-taking and immersive practice, and mediates a nationwide network of like-minded artists, builders, designers, and developers to produce unique projects that engage a broad public. Dashboard has commissioned and funded artwork from more than 75 US-based artists, reaching a height of $50,000 in artist grants for FY 2015. Of the 20 exhibitions they've hosted in vacant properties since 2010, 90% now house thriving businesses like galleries, newspapers, restaurants, music venues, and more. Speaking of Making is a series of conversations about work and the creative process. Join us as we welcome Artist in Residence RENÉ TREVIÑO to Serenbe. RENÉ will give a presentation on how he makes his work, followed by a cocktail reception. This is a free event, open to the public. No RSVP is necessary. Please join us for a community potluck to welcome Artist in Residence Sally Bradley following her Speaking of Making talk. Attendees are encouraged to bring a covered dish and plate + utensils. A cash bar will be available. Join us as we welcome Artist in Residence Sally Bradley to Serenbe. Sally will give a presentation on how she makes her work, followed by a cocktail reception. This is a free event, open to the public. No RSVP is necessary. Guests of Speaking of Making are encouraged to continue the evening with a play, concert or film at Serenbe. Join us as we welcome Artist in Residence Erika Adams to Serenbe. Erika will give a presentation on how she makes her work, followed by a cocktail reception. This is a free event, open to the public. No RSVP is necessary. Guests of Speaking of Making are encouraged to continue the evening with dinner at The Farmhouse Restaurant and a play, concert or film at Serenbe. Serenbe is pleased to announce its inaugural season of Art Over Dinner. Join us at the table as we engage with the latest personalities in art and culture. At this dinner we welcome filmmaker Erin Bernhardt. We will also be screening Bernhardt's documentary Imba Means Sing. Art Over Dinner is a series of intimate gatherings with artists and personalities and the organizations that support their work. On twelve evenings throughout the year, we will set one long table, set it for dinner, collaborate with chefs and farmers to bring a seasonal meal that showcases winemakers and brewers, and invite our guest artists to spark the conversation. Seating is limited to 40 guests on the outdoor deck of The Art Farm at Serenbe. Learn more about the dinner series and reserve your seat at the table. Please join us for lite bites and beer+wine to welcome Artist in Residence Bess McCrary. Friday, May 8th @ 6:30pm in the Blue Eyed Daisy courtyard. And consider staying for Serenbe Film's Shorts at Sundown at 7:30pm. Details and tickets HERE. AIR Kids is a series of family workshops for children aged 4 to 104. Join us for a Sunday walk and workshop with Artist in Residence Leslie Iwai. Leslie will lead us on a nature walk then guide us through a workshop to make art about what we find in the woods. Participants are asked to bring scissors, glue and a handful of markers/crayons/color pencils. We will have some of these supplies on hand and will provide all other materials. gloATL was founded by choreographer Lauri Stallings and production specialist Richard Carvlin in 2009. They are committed to collaboration, creative process and listening to people. They felt gloATL was necessary to help revitalize identity in the American South and have achieved this goal by underscoring human interaction in contemporary performances. gloATL bends genres with a pool of conductors, filmmakers, rappers, fashion and visual artists. Art Over Dinner is a series of intimate gatherings with artists and personalities and the organizations that support their work On twelve evenings throughout the year, we will set one long table, set it for dinner, collaborate with chefs and farmers to bring a seasonal meal that showcases winemakers and brewers, and invite our guest artists to spark the conversation. Seating is limited to 40 guests on the outdoor deck of The Art Farm at Serenbe. Learn more about the dinner series and reserve your seat at the table. At this dinner we welcome Serenbe’s Artist in Residence Leslie Iwai for an exploration of how scientists and artists inspire one another’s work. Iwai is an installation artist and sculptor. Drawing from a rich educational background in mathematics, chemistry and architecture she delights in finding and creating connections between the built and natural world as she constructs and combines diverse materials into spatial narratives. Leslie works out of her studio in Middleton, Wisconsin where she is currently creating a body of work inspired by a groundbreaking discovery in cellular division at the Carbone Cancer Research Center at the University of Wisconsin in Madison. Join us as we welcome Artist in Residence Leslie Iwai to Serenbe. Leslie will give a presentation on how she makes her work, followed by a cocktail reception. Come join us for a cocktail and learn more about Serenbe's Artist in Residence Program. Presentation at 5pm, cocktail reception following. How is AIR Serenbe funded? How do artists get invited? How do you get to meet them and see their work? Hundreds of neighbors and friends impacted! Serenbe Residents—here's an opportunity to meet your neighbors and make new friends by getting involved. If you're outside the community, we need you, too! Our partnership with Rural Studio, Serenbe Development and the support of the Serenbe Institute provides the foundation to ensure we keep expanding our commitment to the arts and artists. We believe art makes life better and commit our resources and energies to supporting the creative process. Artists live lives of great passion and commitment and having them live and work for a while at Serenbe enriches us all. Ticketing/RSVP: This is a free event, open to the public. RSVP to Brandon Hinman, brandon@serenbe.com. Guests of this event are encouraged to continue the evening with dinner at The Farmhouse Restaurant and a play, concert or film at Serenbe. Serenbe is pleased to announce its inaugural season of Art Over Dinner. Join us at the table as we engage with the latest in art and culture. Art Over Dinner is a series of gatherings with artists and the spectrum of individuals and organizations who support their work. On select evenings throughout the year, we will stretch one long table, set it for dinner, collaborate with chefs and farmers to bring a seasonal feast, showcase winemakers and brewers, and invite our guest artists to spark the conversation. Join us at the table as we explore how puppetry shapes our imagination and our City. In 1978, Kermit the Frog and Jim Henson cut the ribbon to open the Center for Puppetry Arts. Since then, the Center has inspired generations of children and adults through our performances, educational workshops, and exhibitions. Now, the Center is in the midst of a transformative expansion that will allow it to touch even more lives through the art of puppetry. Set to open in 2015, the new museum space will feature expanded exhibit areas for both a Global Collection and the Jim Henson Collection. These new exhibitions will be immersive and interactive, allowing guests of all ages to explore puppetry in unique ways, challenging preconceptions and giving a new appreciation of the global scope and universal power of the art form. As part of this project, it is also protecting and preserving hundreds of international and Henson treasures for future generations to enjoy and understand. This expansion will bring the Center’s world-renowned collection and the largest collection of Henson’s art to a wider audience, and will continue to make the Center a one-of-a-kind experience within the world of puppetry. Join the Center’s Artistic Director Jon Ludwig, Exhibitions Director Kelsey Fritz, and Resident Puppet Designer Jason von Hinezmeyer as they share details about this next great step in the Center’s journey. Andrew Moore Photographer in September.